Hanamichi Sakuragi, a tall, boisterous teenager with flame-red hair and physical strength beyond his years, is eager to put an end to his rejection streak of 50 and finally score a girlfriend as he begins his first year of Shohoku High. However, his reputation for delinquency and destructiveness precedes him, and most of his fellow students subsequently avoid him like the plague. As his first day of school ends, he is left with two strong thoughts: "I hate basketball" and "I need a girlfriend." Haruko Akagi, ignorant of Hanamichi's history of misbehavior, notices his immense height and unwittingly approaches him, asking whether or not he likes basketball. Overcome by the fact that a girl is speaking to him, the red-haired giant blurts out a yes despite his true feelings. At the gym, Haruko asks if he can do a slam dunk. Though a complete novice, Hanamachi palms the ball and makes the leap...but overshoots, slamming his head into the backboard. Amazed by his near-inhuman physical abilities, Haruko quickly notifies the school's basketball captain of his feat. With this, Hanamichi is unexpectedly thrust into a world of competition for a girl he barely knows, but he soon discovers that there is perhaps more to basketball than he once thought. Slam Dunk was awarded the 40th Shogakukan Manga Award for best shounen manga in 1994. In a 2006 poll for the 10th Japan Media Arts Festival, the series was voted by Japanese fans as the #1 manga series of all time. With over 120 million copies sold as of 2012, it is one of the most successful manga series to date. Its wide success led to a large increase in the popularity of basketball in Japanese youth. In 2010, Takehiko Inoue received special commendations from the Japan Basketball Association for popularizing basketball in Japan. The series was published in English by Gutsoon! Entertainment under the Raijin Comics Imprint for five volumes from July 2, 2003 to May 5, 2004. After Gutsoon's shutdown, publishing rights to Slam Dunk were purchased by VIZ Media who then republished the series under the Shonen Jump imprint from September 2, 2008 to December 3, 2013. It was published in Spanish by Ivrea España from February 2003 to September 2005 and republished in Kanzenban from January 2010 to May 2016. Slam Dunk is probably the best manga ever published and the anime version is one of the best I have ever seen. Even though the series has ended more than a decade ago, many people wiill wholeheartedly agree that this franchise has stood the test of time. The story is simple but the execution is incredible, each chapter is filled with humor, action, drama, comedy and a whole lot more. The anime series was good and worthy of being considered a landmark anime, but if you have yet to see the anime then you don't know what you're missing. However there are things that are not shown in the anime series which is why it is crucial for you to read this manga. The interhigh games are a blast! Takehiko Inoue certainly knew how to end the series with a bang! The last game is so good, every character is at their best and certainly no other title can rile up the readers emotions like this, it really feels like your watching the NBA finals. The artwork is simply great even though there are a lot of better looking manga out there, the decade old graphics still manages to go toe to toe with other more recent titles out there. The characters of this title are by far the most fully developed in any title out in the market and I'm not just talking about the main characters, I'm also talking about the supporting cast even those belonging to rival teams. The character development is so good that it is difficult to choose one character as a favorite. Each character has a well told background even those who appear in just a few chapters have a very detailed and well executed background story. You'll probably remember the names of not only the Shohoku players but also the names of their rivals, most notably &quot;Sendoh&quot;. Overall Slam Dunk is one of the best Manga ever made and I'm sure that once you read it, you will agree with me. I guarantee that you won't be able to resist finishing the manga in a few days if not a few hours because it is that damn good. If you think the anime was great, try reading the manga and I'm sure you'll feel that the anime series could have been better, the interhigh games are one hell of a joyride! Before I start, I must point something out. If you're expecting something like Kuroko no Basket with Zone, 100% accuracy shooting, perfect copy and other supernatural powers, stop reading right now, because it has none of that. Also, SD focuses more on the whole team, rather than just 2 characters (Kuroko and Kagami). Now, onto the recommendation. The story follows Sakuragi Hanamichi, a delinquent who is in love with a girl named Haruko and wants to impress her in some way, so he decides to join the basketball club. That was his initial reason for joining, but he gradually develops a love for the sport and starts working harder than anyone else. Starting off from the very basics like dribbling, lay ups and defense, slowly gaining experience, you can see him improving with every match that passes. The art looks rather simple at first, but improves after some time. The matches in particular, are really well drawn. Shots, dunks, passes, player movements - everything is drawn in a way you'd understand what's going on. The characters is probably the strongest point of this manga. Sakuragi is one of the most well-developed main characters I've seen in all of manga/anime. The same can be said for the rest of Shohoku's team members. Heck even the rival teams are so well-developed, you would have a problem chosing who to cheer for. My favourite non-Shohoku character is Ryonan's ace - Sendoh. He is such an amusing and fun character that you just can't help but love. As a sport manga, it's really beginner friendly. Even if you don't know much about basketball, this manga will teach you everything about the sport. From the basics like how to dribble, how to shoot a ball correctly, passing, to advanced skills like how to grab a rebound successfully, how to screen-out and set up screens, how to avoid the different kinds of fouls (double dribble, travelling, pushing and so on) and to use fouls to your advantage. Speaking of fouls, there are a lot of them in this manga, unlike in Kuroko no Basket where there was barely any contact between the players. If you get 5 fouls, you leave the game. Fouls bring more tension into the matches (which are already intense enough) and makes them more enjoyable. When the players are tired, they are tired. What I mean by that is that their movements slow down, shooting percentage goes down and the players become more vulnerable to mistakes. This is what realism is. I also have to mention the final game (don't worry, I'm not gonna spoil it). This manga probably has the best final game ever. It hit all the right points and it was so damny emotional. I was barely holding my tears in the last 4-5 chapters of the last game and I doubt any other sports manga can make me even tear up like this. Slam Dunk is the closest thing you'll get to a realistic basketball series. I also have to mention the humor. The humor in this manga is pure gold. I dare say it's near Gintama's humor level. It also references some things from real life, mostly from NBA. That is something rarely seen among anime/manga. Highly recommended for fans of: Hajime no Ippo (it's like its basketball equivalent), Kuroko no Basket (I love Kuroko, but KnB fans must feel the greatness of this manga), Haikyuu and sport fans as a whole. I also recommend this manga to people who want to get into basketball. This one will surely help you with your basketball studies. If you're a regular basketball watcher, or a solid fan of the sport, then Slam Dunk is a must watch for you. This piece of work is skillfully written by the famous author Inoue Takehiko, also known for his other works such as REAL and Vagabond. Slam Dunk also had outstanding sales in Japan and a successful adaptation series (along with four movies) which were sold worldwide, thus inspiring young people to practise basketball passionately. As said above, Slam Dunk is for those who are into basketball. Inoue Takehiko himself has been a basketball player in his high school days, and he is an active NBA watcher, so you don't have to worry about technical mistakes or poorly developed games, 'cause Takehiko truly knows how to write a basketball game and illustrate it, also adding as many intensity as possible, to make a thrilling and memorable game. (There are a few matches involving such great writing). Reason why I mentioned this is, this is the basic feature a basketball series should contain, to attract readers/watchers. The characters are Slam Dunk's strongest point. A meaningful quote (from a review) by Inoue Takehiko is: "I don't force my characters to do things their personality doesn't allow, even if it means to progress the story". I wholeheartdly agree with this saying, and this is possibly why Takehiko's characters have been a successs. Now let's focus on the actual story and characters of Slam Dunk. The main character of the series, which invests more time in him is Sakuragi Hanamichi. In the beginning, Sakuragi is a punk and delinquent who socializes with others of his kind and make troubles. He gets into fighting a lot and a notable characteristic of his, he gets rejected by every female he's confessed to. Heartbroken, Hanamichi stumbles upon Haruko Akagi, a pretty girl, who makes Sakuragi fall in love with her real quick. Due to her being the sister of the basketball club's captain, Hanamichi ended up in the basketball team and that's when his journey as a baskettoman (Hanamichi's pronunciation of basketball player). Simply put, Hanamichi starts a complete beginner, starting from the scratch, such as dribbling the ball, doing lay ups and rebounding. (Also to note that Slam Dunk explains almost every important and basic rule of basketball, via DR.T, a short and amusing tertiary character who has enough knowledge in basketball). And this said, Inoue Takehiko brilliantly develops Hanamichi's gradual growing love for basketball. The Shohoku team's members are all nicely developed. Starting from Akagi, a tough, gorilla looking young boy who is the captain of the Shohoku basketball tean. Akagi has an unbeatable spirit for the sport of the basketball. This very spirit drives along the team in high morale which is very helpful and basically the core of their accoplishments. His relationship with Sakuragi Hanamichi is also one of the best things in the show, they have a cat and mouse relationship in the beginning which develops into a long term friendship. Next, we have the megane kun, which is the essential characteristic to every sports series. A megane kun who is loyal to the team and boosts their morale in times of trouble. Kogure is the vice captain of the Shohoku team and the helping hand of Akagi. They both have known each other since childhood and have a trusting friendship between each other. Rukawa Kaede is the everlasting rival of Sakuragi Hanamichi. Rukawa is always one step ahead of Hanamichi, which irritates him the most and motivates him to actively practice basketball and get better at it. At first, Rukawa gives an impression of a popular, quiet, good looking guy who excels at what he does. And he really does excel at basketball. Though slow (very slow), his relationship wih Hanamichi gives fruits. (Not going to spoil). Also necessary to say, Hanamichi also considers Rukawa a rival in love. Unfortunately for Hanamichi, Haruko is all over and drools over Rukawa, not that the latter cares anyway. Lastly, the trouble makers of the Shohoku. Ryota Miyagi and Mitsui Hisashi. Both have been delinquents and have had constant conflicts with each other. Due to a fight, Ryota is sent to hospital, resulting in a long break in bball.Ryota's quite short, and this makes him a key player for Shohoku. He excels at dribbling the basketball and giving no look passes, cause he knows where his teammates are in the court. He also shoots two pointers at times and has an unmatched speed which comes to hand Shohoku plenty of times. On the other hand, Mitsui Hisashi took a different path from Ryota. He decided to stop playing basketball (reasons stated in his arc, which it's pretty spoiler heavy), but he eventually comes back at the team after an exhaustingly long mini arc (in the anime, mostly). Though those were the main characters, which are awesomely developed, Slam Dunk also focuses on the "opponents" of Shohoku. Aces such as Sendo Akira, Shinichi Maki, Kenji Fujima, Eiji Sawakita are all equally developed and sometimes you root for their team to win. The distinct art of Inoue Takehiko is also enjoyable to watch and read. Slam Dunk actually is one of his first drawn series, and it's a very good chance to watch Inoue Takehiko develop as an artist. Overall Slam Dunk is located at the 2nd place (of sports series). It was an undescribable ride with lots of fun, funny and sad moments. It clearly deserves a 10 in my book, as these kind of series are very rare. 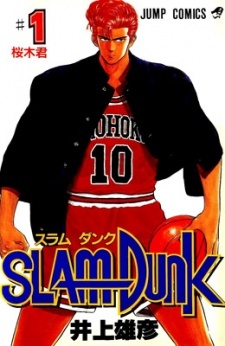 Slam Dunk is the most popular and iconic basketball manga around, thanks to a dynamite main character and Takehiko Inoue's clear passion for the sport. Hanamichi Sakuragi, a red-headed delinquent and complete basketball neophyte, is the heart and soul of Slam Dunk. He's great at various things (beating up other delinquents, being tall, and being rejected by girls are chiefs among them), and while playing basketball is clearly not one of them, don't tell him that; in fact, Sakuragi's brand of unreasonable confidence and swaggery is a breath of fresh air in a genre usually populated by bland genius or meek underdogs as main protagonists. He's a very easy character to root for, and it's delightful to watch him slowly transform from playing just to impress a girl into being genuinely affected by all the feelings that the game entailed. Whether it's his one-sided rivalry with the prodigious Rukawa, his constant goofs in the court, or his endearing simple-mindedness, Sakuragi will make you laugh and face-palm until eventually he'll also make you fist-pump in pride as he successfully defended a dangerous opponent, secured a key rebound, ,nailed his first jump shoot, and many more. This might seems like an unnecessarily obvious statement, but there's really a lot of basketball in Slam Dunk. It's drawn at a very deliberate pace; Inoue likes to take his time, often going over two or three volumes to depict a single match (for the final match, he went all-out and spread the match through 6+ volumes). Although there's a significant amount of humor, rom-com triangle, and off-court basketball events in the initial volumes, once the main cast is assembled it's pretty much Basketball Action all the time. Non-playing characters like Sakuragi's love interest Haruko and his amusing band of delinquent pals are inevitably demoted into the role of spectators, and character development is practically confined in the realm of basketball court as the main cast (especially, but not limited to, Sakuragi) learned to utilize/expand their strengths, overcome their weaknesses, and develop chemistry with each other. It's safe to say that if you enjoy the entirety of Slam Dunk, you're already a big fan of basketball or on your way into becoming one. Inoue's art is a big part of what makes the matches, slow as they are, so enjoyable. You'd be hard-pressed to find more passionate depiction of a basketball game on manga pages; whether it's rim-shattering dunks, ferocious blocks, or gorgeous three-point swishes, there's a range of dramatic moments native to the sport that he successfully captured. It gets increasingly beautiful and detailed, too. Homages to the 1990s NBA are abound, from the players themselves (Sakuragi and team captain Akagi, for example, were clearly modeled after Dennis Rodman and Patrick Ewing respectively), some iconic poses, and jersey color schemes. There's also a sense of real-life plausibility within the games, as the players in Slam Dunk thrived with realistic skills and athleticism rather than over-the-top superhuman traits. Questionable tactical moments do exist (quad-teaming a single player, anyone? ), but in terms of the general flow of the game,it's still a lot more faithful than your typical sports manga. Slam Dunk ends rather abruptly, covering only a single tournament season, and some potential future opponents/match-ups being teased ultimately never materialized. It could've become a long-running epic a la Hajime no Ippo, but apparently Inoue had other plans. Even then, it's still a powerful and memorable journey, led by a beloved red-headed brat.